Another great temple visited on my first trip to Kunming, was the famous Bamboo Temple, located in the hills due West of Kunming. The original gate ticket is shown on the right. 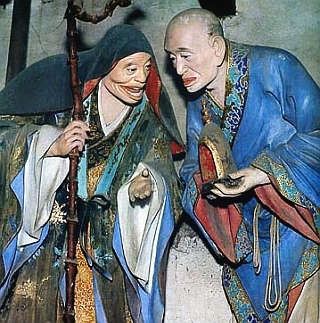 This temple featues some fascinating - if bizarre - statues of the 500 Lohan (or Buddhist adepts), shown in the photo below. These sculptures date back to the late 19th Century, and seem to ramble up and down the walls like characters in a mad cartoon. Some have the extended legs of storks, while others reach across the room like Plastic Man. Most of them have absurdly long eyebrows (sign of longevity and wisdom), shaved heads, and bony figures. And all of them have amusing details in vivid color, including robes, walking sticks, beads, sandals, and sacred relics. In one of the smaller halls there remain a few of the lohan sculptures from an earlier incarnation of the temple (which has burned down many times during the last 1,000 years). These older lohan are much more serene and minimalist, giving us pause to wonder about the practicioners who made the long journey to those quiet hills centuries ago. Before the temple became a carnival of goofy caricatures, those older lohan retain a deep peacefulness in their features. Those olden times are captured in their faces: cold stillness of the mountain slope, fragrance of burning incense as it drifts away into towering stands of bamboo.